This custom prototype is a fully functioning wifi-capable plush companion for kids to carry around as a surrogate for their parents when away from home (eg business trips, errands, vacation). While staying with a healthcare provider, the plush can be unplugged from the wall, and carried around by a child of any age; the internal components are encased in a protective shatter-proof shell and padded to prevent impact injuries during the rigors of play. 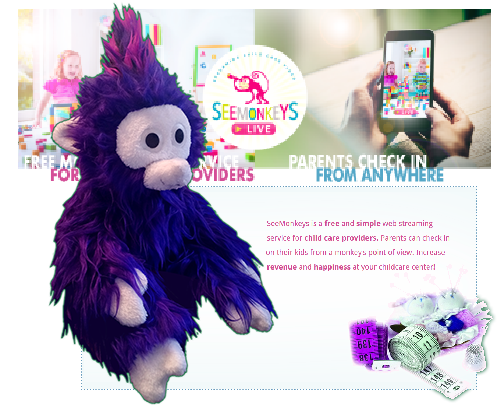 Using the integrated phone app, a parent can hear when the plush is spoken to, speak through it to their child, and can see from the perspective of the money’s eye; this allows a parent to interact with their child in all those ways as if they were physically there in the monkey’s place. There were many challenges with this project, especially with respect to childproofing the delicate components and ensuring that the retrofitted components from an off-the-shelf webcam could function in this new environment without overheating. There also were numerous security hurdles presented by the project as a whole, such as the Child Online Protection Act (COPA), physical safety (reducing choke hazards), and penetration testing of the programmer’s proof of concept site/app.